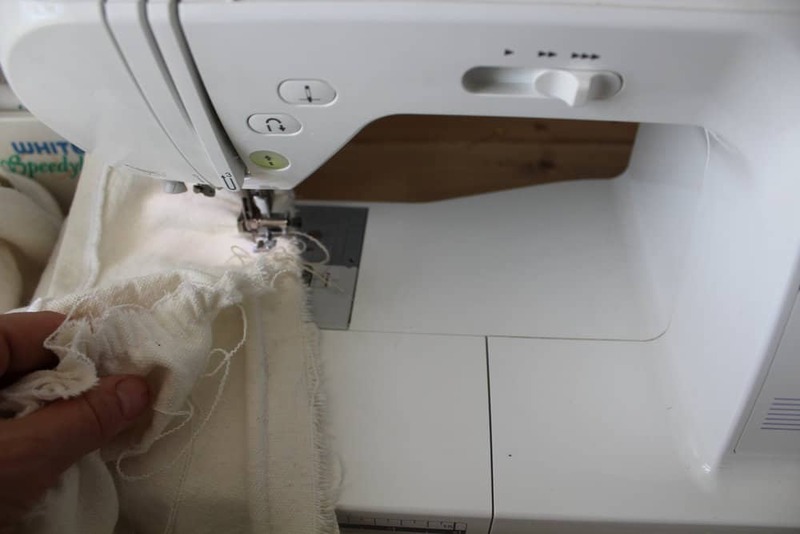 I have been sewing simple things for years now; dresses for my little girls, pillows, curtains, throw blankets and even simple slipcovers for our living room couches. But, I must admit, this project challenged me. This project was hard, but with patience and perseverance (and a few choice words) totally doable! 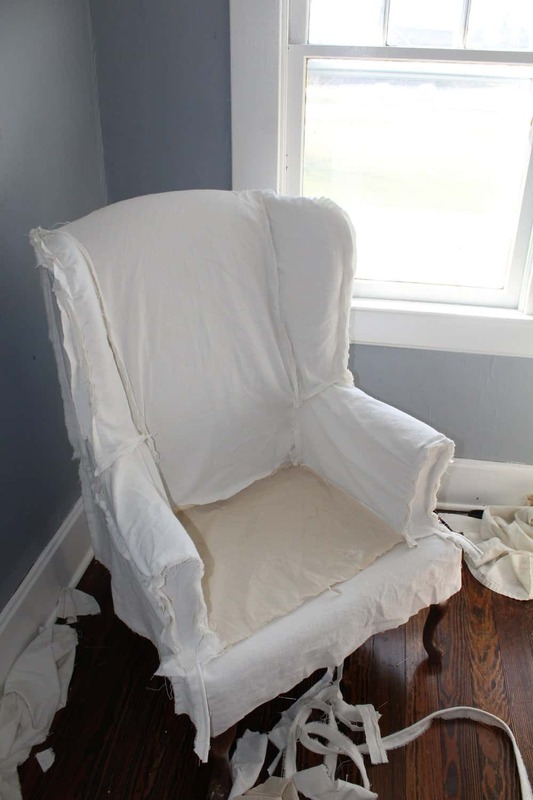 For this slipcover I used painter’s drop cloth that I bleached, a process I described in this post. The drop cloth I use can be found HERE. 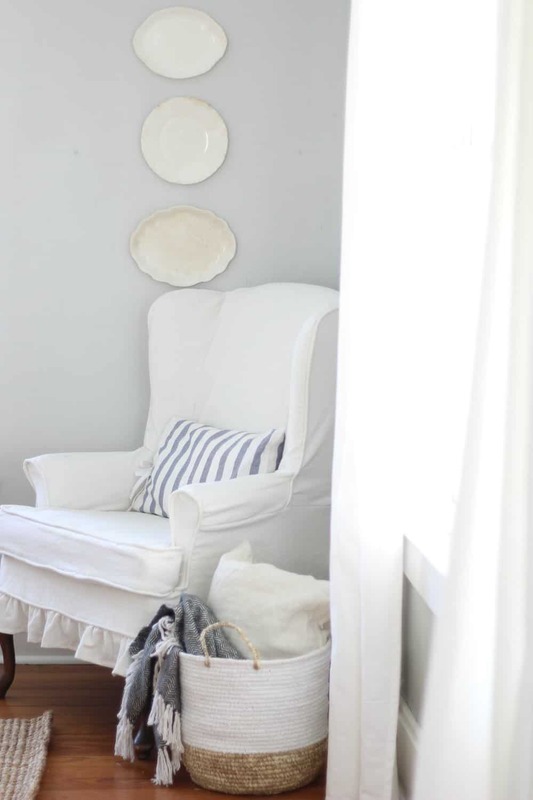 UPDATE MUST READ: I have heard from several readers that the brand of drop cloth you buy makes all the difference. I did not know this, since I have only ever used this brand from Amazon. Other brands turns gray and off white. UPDATE PART TWO: Thanks to Lori, a lovely reader of my blog, I now know why some other brands won’t turn white. The drop cloths I recommend from Amazon are 100% cotton, so bleachable. Some brands are made with 50% polyester, so unbleachable. I knew people were having trouble with other brands, but now I actually know why! Slipcovering is more about the process than an actual step by step tutorial. 2. If you are adding piping, use the original chair as your guide. Put it in all the places that the original maker of the chair put it. 4. Use a lot of pins and sew often. This is not a quick process. You will want your chair near your sewing machine, so you can continually go back and forth to make sure everything is fitting okay. You never want to pin and sew several seams at one time. 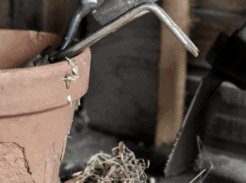 Always pin a little, sew it, and return to the chair to pin a little more. Taking care to go slowly will ensure an excellent fit! To begin, I made enough piping to get me through the whole project. 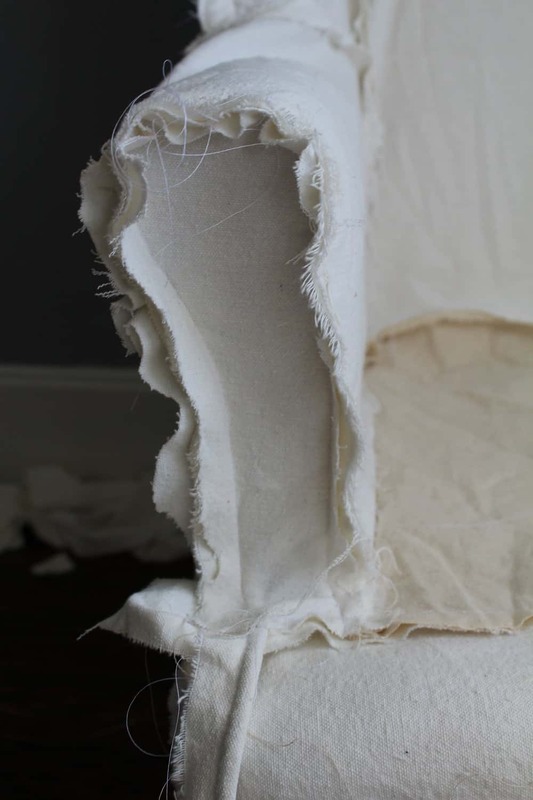 To do this, I sandwiched 6/32″ cotton cord inside a four inch strip of bleached drop cloth. I used a zipper foot to get the needle as close to the cord as possible, without sewing over it. Next, I cut and draped all the pieces over the chair. (This will make waaay more sense in the video.) I cut pieces for the outside and inside of the wing, two pieces for the back, two pieces for the arms, two pieces for the front of the arms, two outside lower pieces, a piece for the front apron and a large piece for the front chair back (if that makes any sense at all). I totally guesstimated all the sizes of the pieces. I started by overlapping the two back pieces and pinning them (right sides together) to the chair back piece. It is really important to keep the chair back piece smooth and tight. It will the most visible in the finished slipcover. Following the lines and seams of the original chair, I pinned the outside wing pieces to the back and to the inside wing pieces, which I also pinned to the front of the chair piece. Have I lost you? It will make sense in the video. You can see how many pins I used in this process. I wanted to be sure they would follow the lines of the chair, ensuring a nice fit. I made sure the pins created a line for me to sew along. While slipcovering I stop several times to be sure everything is still fitting. Sometimes things may appear a bit wonky but might actually turn out when you pull it taut at another seam. And remember that mine looked like it wasn’t going well halfway through, but turned out totally fine! I could tell that I wasn’t going to have quite enough bleached drop cloth to finish my project, so I used unbleached drop cloth for the portion that would be hidden underneath the cushion. 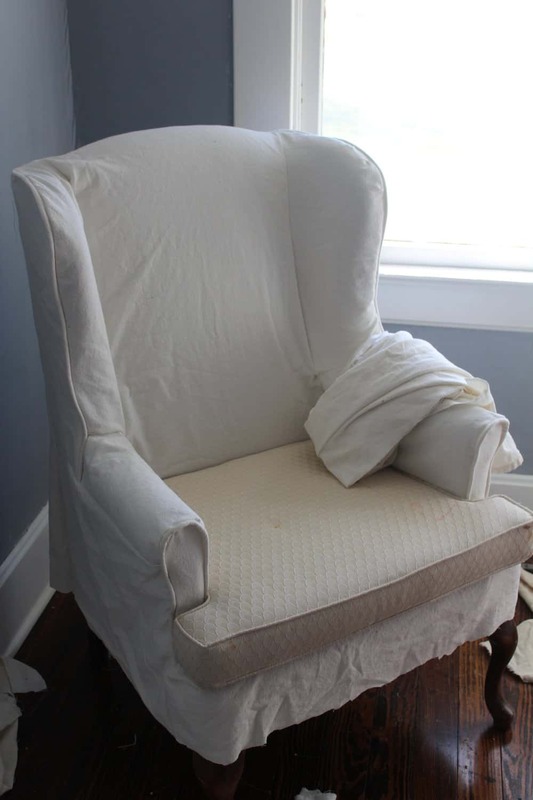 Notice in the photo below how all the seams of my slipcover are along the original seams of the chair. Use the piece as your guide. This will allow you to slipcover anything. After the main portion of the slipcover was finished, I added a ruffle and piping to the bottom edge to finish it off. For the cushion, I created an envelope style cover, as opposed to using a zipper. To make the pattern, I traced the shape of the cushion onto the drop cloth, leaving about a half inch on all sides for seam allowance. For the bottom part of the cushion I cut two pieces that would overlap each ther for the cushion to fit inside. I also cut a long strip that would go around the center of the cushion to join together the top and bottom pieces, with piping sandwiched between. If you are on the fence about trying this, I encourage you to do it! As long as you go slow and check the fit often, you can totally do this. I can’t wait to see yours Katie!! If you have any questions don’t hesitate to ask! You did an amazing job on your slipcover and you make it sound so easy even though I know it’s not. I’m working up the courage to make a slipcover for a wingback I found. But before I begin I have a couple of questions that hopefully you can answer. 1. How many drop clothes did you use for this project ? 2. When you bleach the drop clothes, does the bleach "break down" or weaken the fibers of the drop cloth ? 3. Did you finish the seams of the slip cover so it wouldn’t ravel when washed ? Thanks for sharing your wealth of knowledge. 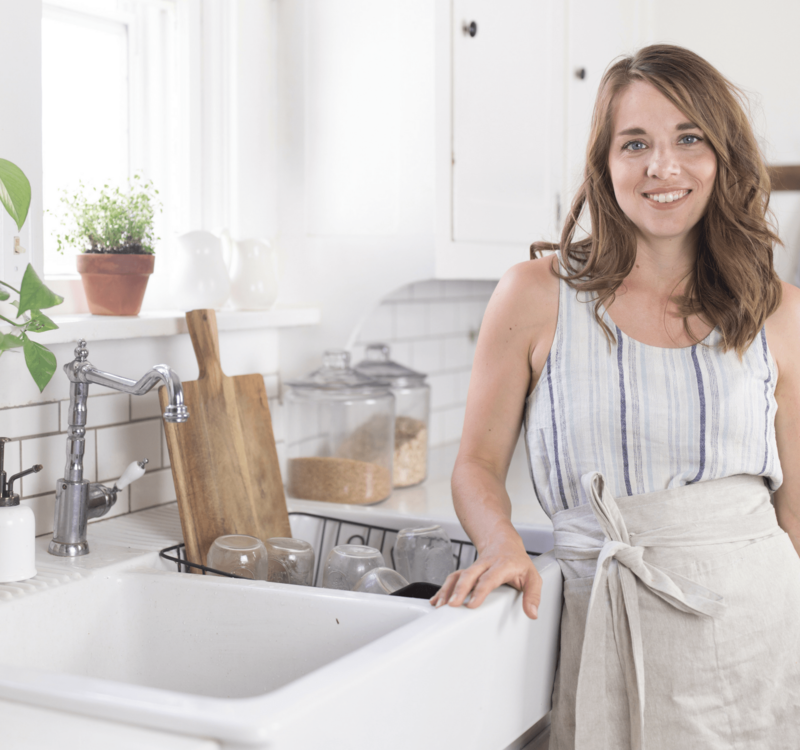 Love, love, love your home and blog. Hi Vanessa! Thank you for stopping by! I used two packages of the 9′ by 12′ drop cloth for this. I don’t notice that it breaks it down, but I’m sure it probably does do that a bit. I didn’t finish the seams, because of laziness, but I should have! Every time I wash my couch slipcovers, I get tons of strings. I really should run them through the serger! Thank you so much! Great tutorial – easy to understand and follow. I am currently making slipcovers for two wingback chairs. I have a major question that I have researched for days and days, no answers anywhere that I can discover. upholstered. Does the fit and the weight of the skirt do the job or is there something I should know about in advance? Any ideas, tips, suggestions most welcome. And then I may be overthinking this and it will not be a problem – who knows? I don’t secure them to the chair in any way, so I guess it is just the weight of the fabric that keeps them down. I have never had a problem with that. 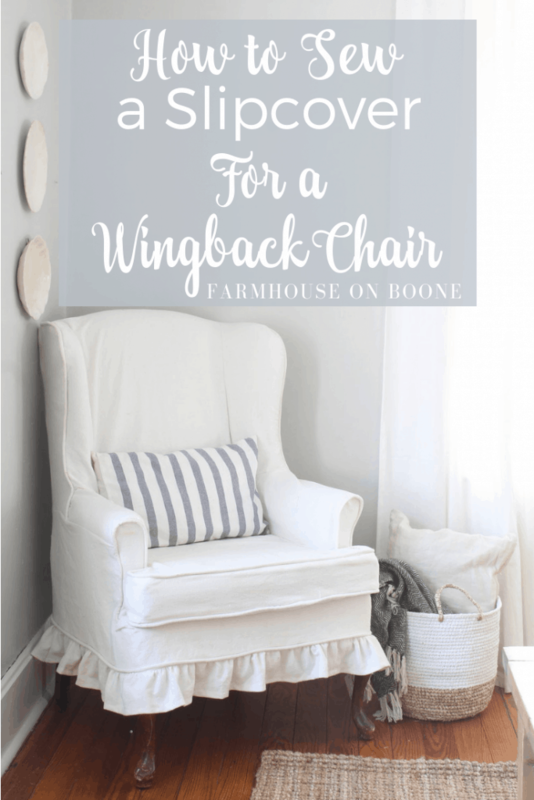 I enjoyed your tutorial on wingback slipcovers. I’ve reupholstered and slipcovered countless chairs in different styles. I know the answer to the problem of unsuccessful experiences bleaching slipcovers. 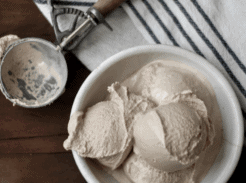 The problem is fiber content. The drop cloths that you recommend from Amazon are 100% cotton and therefore are bleachable. The drop cloths that are sold in Home Depot by the brand Everbest are 50% cotton and 50% polyester, making them non-bleachable. Unfortunately, the fiber content is not listed on the packaging, but on a tag sewn into the hem of the cloth. 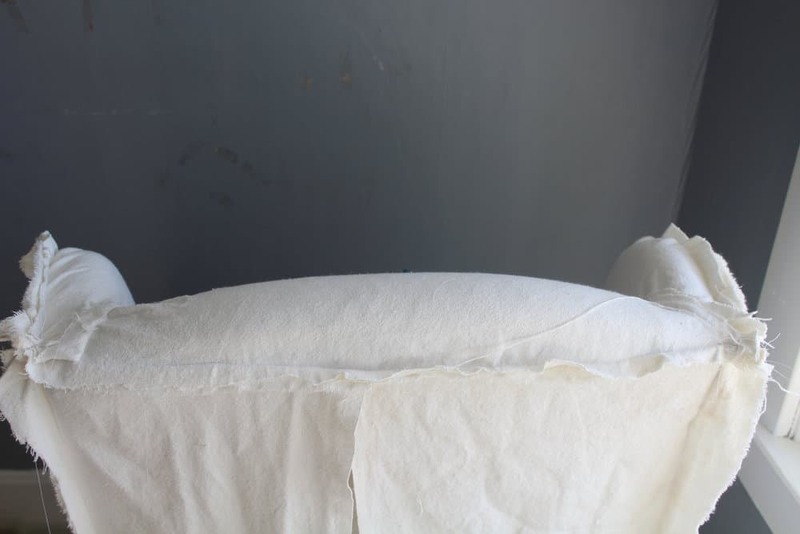 Only 100% cotton fabric will bleach white and become soft from the process. Wow, Lori! Thank you so much!! I had no idea what the difference was. That totally makes sense! I am going to add this to my posts! 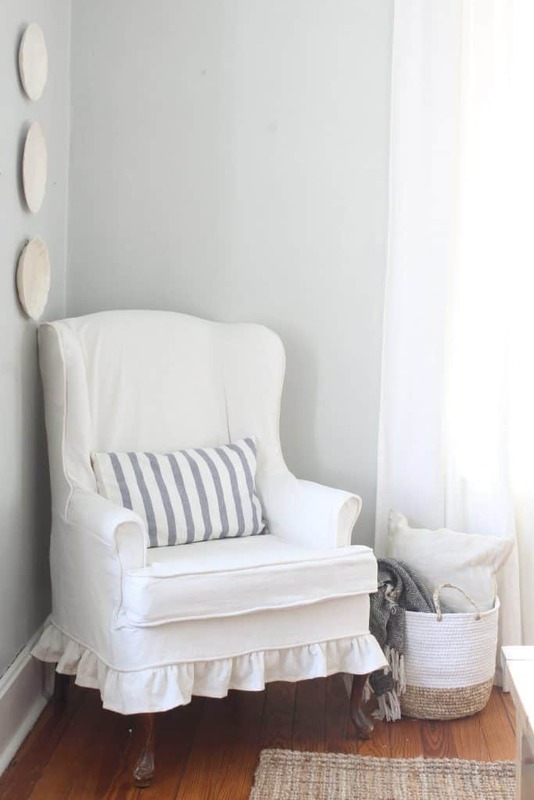 Do you remember how many orders of drop cloth (or yards) you needed for this chair? Really fabulous and super helpful video! thanks, I feel so much more confident to try to make my own slipcover! Great tutorial. Thank you. How many metres of fabric would a wing back chair like that require? I believe it took one package of drop cloth, if I remember correctly. I use the 9 foot by 12 foot. Not sure how many metres that is though! It might be worth pursuing if one wanted a more taut fit to put velco strips at the bottom of the chair and at the underside bottom of the cover. Just a thought. Do you fasten the back pieces in any way or do you let them hang free. Hi, I love your slipcover look. Any chance if i provided pictures and measurements you would sew me a slipcover? Hey Michelle! Sorry, but I am not taking on any orders for slipcovers. They are very custom to each individual chair, so I can’t go off measurements alone. I’m thinking of trying this! What weight of 100% cotton canvas did you use? I see they come cotton thickness as low as 6 oz weight to a thicker 10 oz weight. Do you know what weight of cotton you used and if you would prefer a thicker (or thinner) material weight in retrospect? Hi! I love this tutorial you have put together. I’ve just passed the bleaching stage and I’m getting ready to make my piping. Should I wash and dry the cording in advance as well? It says it’s 100% cotton. I was just curious if you did before sewing. Thanks! Your video or is helpful thanks for making it. I wish I could see a picture of the finished back of the chair. 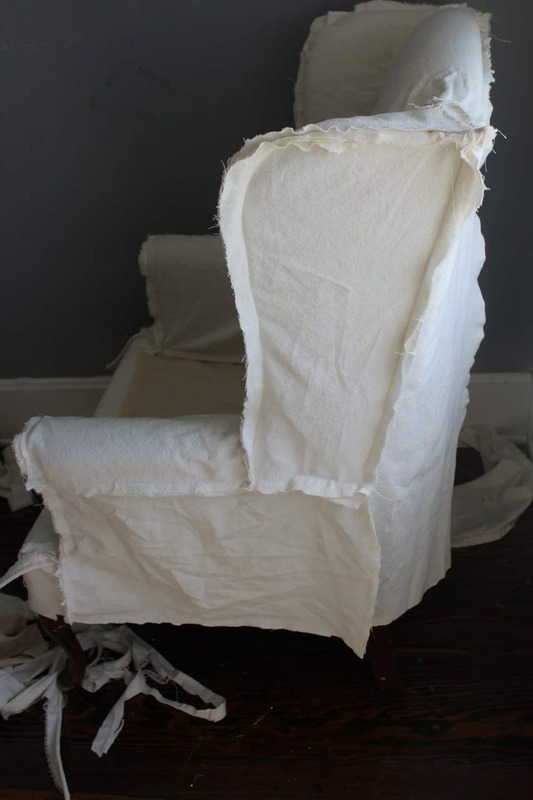 HI and thank you for the wonderful video which I have followed as much as possible making a “trial” slipcover out of a sheet set before I cut into the painters cloth..however I have a sloped front to the arm of my wing chairs and the cover for it doesn’t look right . Could you please give me some suggestions on how to fit the slipcover to the arm front to make it look good…o , also the front of the chairs arm is covered in the nail heads that are used to decorate furniture…I can send you a picture if you like. Thank you again…. If you add nail heads you are doing more of an upholstery project than slipcovering. Email the pic to lisa@farmhouseonboone.com and I’ll check it out! Dear Lisa, My mom has a couch , loveseat and recliner that I would like to slipcover. Do you have videos for these pieces? Thank You for your wonderful video tutorial. I am wondering how the slipcover stands up to dirt? I have teenagers and a dog that won’t stay off furniture. I’m assuming if there is visible dirt on the slipcover, one could use a product such as “shout” and bleach to remove the dirt or stain? 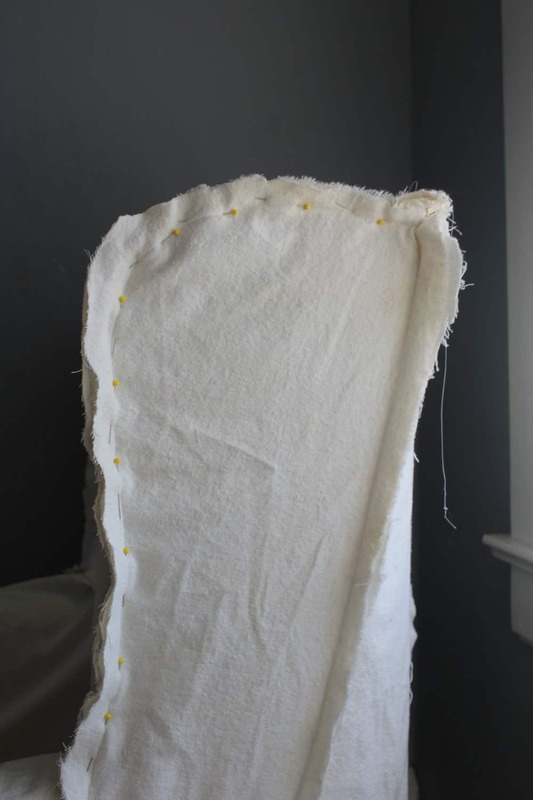 Can you show me the back of the finished slipcover and how you fastened the two back panels together? Your video has inspired me to attempt making my own slipcover. However, in my space, the back of the chair is just as visible as the front. Thank you for the wonderful tutorial. You have inspired me to attempt making slipcover for my two wing back chairs. However, in my space, the back of the chairs are just as visible as the front. Could you show me the back of your finished chair, so I can see how you fastened the two halves of the back panel? I know there is more than one way to do it, but I would like to see how you did it. Thanks again for your through tutorial. Excellent video! I am going to follow you everwhere!